_Parent Volunteers Parent involvement is important to The Glasser Preschool! All preschool parents are required to assist in at least two volunteer areas during the school year. Opportunities are available for both ”stay at home“ and parents who work outside of the home. Sign-up forms for volunteer opportunities are contained in your orientation packet. GPS Parent Board A parent advisory board governs Glasser Preschool. All preschool parents are invited and encouraged to attend the monthly preschool board meetings. Looking for a way to become more involved with your child’s school? How about serving on the Glasser Preschool Board? Please feel free to contact our Glasser Preschool Director or any Board member for more information. Parent Visits Parents are welcome to visit the classroom at any time. You may find it enlightening to quietly observe your child's interaction. Parent-Teacher Conferences Formal conferences occur twice a year to discuss your child’s progress. These conferences are a great time to raise issues and communicate your concerns about your child. Of course, the teachers and Director are always available at other times to discuss your child. Shabbat Parent If you would like to share Shabbat in your child’s class, please sign up on the sheet outside your child’s classroom. We do not have Shabbat parents in the Gan Katan classrooms because we have found that this is too disruptive and difficult for the children. Shabbat parents can read a book to the children and then may donate the book to our school library. Of course, any other talents you would like to share with us (like playing an instrument) at this time are also welcomed. The Shabbat parent also is encouraged to participate in our Shabbat rituals. Tot Shabbat Special Shabbat services for our preschool children are held monthly throughout the year. Families are strongly encouraged to attend. Parent Education Throughout the year we will be offering various parent education classes and workshops. Please take advantage of these wonderful learning opportunities. Cleaning We ask parents to volunteer on a weekly rotation to take home a bag of dress up clothes and plush toys to launder to help maintain the cleanliness of the preschool. Birthday Celebrations Parents may bring a store bought snack to the class on their child’s birthday. Please arrange your celebration in advance with the teachers. It is suggested that each child make a donation of a book to the school on their birthday. Social & Fundraising Activities Social activities for parents, families, and children are offered through the preschool during the school year. We ask and expect parents to support our fundraising efforts. Our major fundraiser is our joint Silent Auction with Oak Park Temple, which will be held on February 4, 2012. To make this event a success we need the participation of everyone – volunteering, donating auction items, attending the event, etc. Donations Any donation, no matter how large or how small, is guaranteed to delight our children for years to come. We honor our donors with an acknowledgment in our newsletters, and send donation notes to the appropriate addresses when a gift is made in someone=s memory or honor. We also gratefully accept donations of gently used toys and books. Holiday Celebrations Throughout the year we will be having in class celebrations of Thanksgiving, Hanukkah, Purim and Passover. [Please note that we do not celebrate Halloween or Valentine’s Day at Glasser Preschool.] We encourage family members to attend these events. Parents are welcome to join us each Friday at 10:30 AM/2:00 PM in the Chapel when the whole school gathers to sing Shabbat songs. Buddy Families Glasser Preschool welcomes new families to our community and wants to help make their introduction to our school as easy as possible. In August before the school year starts, new Glasser Preschool families are matched with a “buddy” returning Glasser Preschool family. Returning Buddy families are asked to do the following: Make a welcome call prior to the start of school; Reach out to their buddy at the school start; Schedule a play date, family picnic, or some other casual get together prior to school or soon after school starts; Invite buddy family/parents to join them at preschool events; and Introduce new parents to their GPS friends. Room Parents Room Parents play an essential role at Glasser Preschool. A room parent liaison from the Glasser Preschool board will co-ordinate the room parent activities. One main job of the Room Parents is communication. Throughout the school year room parents will be asked to call or e mail their classroom parents to invite and encourage them to come to different preschool activities throughout the year. Room parents also notify the rest of their classroom if school is closed due to inclement weather. Room parents can be a great source of feedback and suggestions for the Director and Board. Room parents will also coordinate special activities for their class families throughout the year such as picnics, parents night out, gifts, etc. The primary goal of room parents is to help build a sense of classroom community for all the families in your class. Mom’s And Dad’s Night Out At Glasser Preschool the parents are as important to our community as the children. Want an evening out without kids? 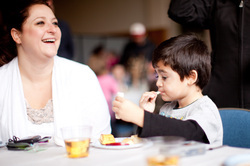 Wish you had more time to socialize and get to know some other Glasser Preschool parents? Join us for our monthly Mom’s and Dad’s nights out. Details about these events will be contained in the monthly newsletters. Parent Bulletin Board Looking for a babysitter? Want to car pool to preschool? Want to sell your crib? The Glasser Preschool Bulletin Board is a perfect place to post this information. The board is located at the bottom of the stairs on the first level near the rotunda. Feel free to post information here to share with our Glasser Preschool family.